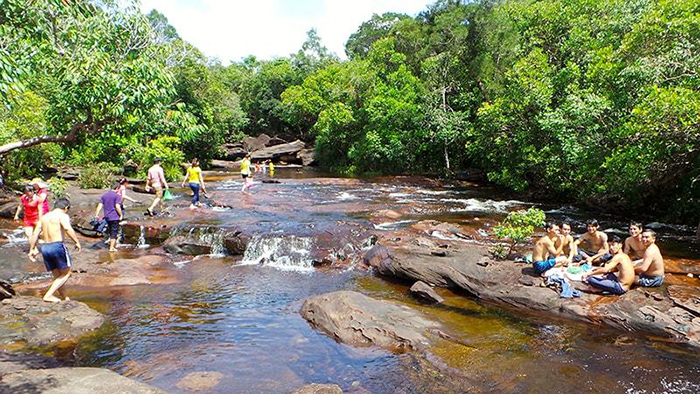 Phu Quoc tourism owns not only the blue sea, white sand, and tasty seafood but also the clear streams. Once you come to Phu Quoc, it will be a shortcoming to not visit Da Ban stream to admire the majestic and rich natural beauty of this masterpiece. 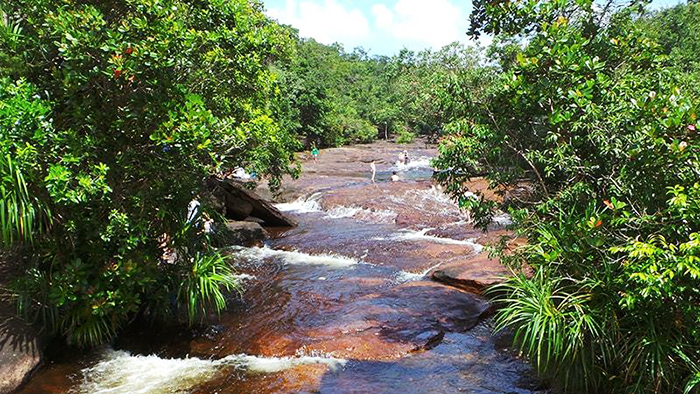 Da Ban is a stream located in the northeast of Cua Duong commune, Phu Quoc, about 10 kilometers from Duong Dong town. 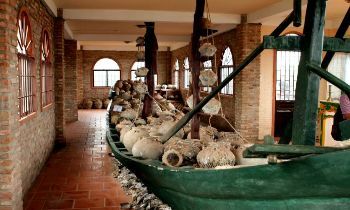 Currently, this place has become an ideal ecotourism destination for those who love to discover natural beauty in Phu Quoc island district and it is also the main source of drinking water for Duong Dong town. It is located 16 kilometers east of the center of Duong Dong town – the center of Phu Quoc island. On Duong Dong route 1 kilometer north, turning right along a bendy road, tourists will arrive at Da Ban stream – a wonderful natural site. The weather is as cool as that of Dalat and it is very quiet because there are not a lot of people here. The stream rises from a high mountain range edging their way through big and flat stone slabs lying in series. It is the so-called Da Ban stream. The reason for the name of Da Ban is that there are many large flat stones as the table surface due to the erosion of strong streams flowing around from the mountains. Therefore, Da Ban stream is cool and beautiful as in heaven, and is also associated with mysterious and thrilling stories such as this is the place where the fairies sit and bathe each time they visit the earth. According to the experience of those who have come to Da Ban stream, the most appropriate time to travel is from early May to the end of November. Because this time is the rainy season, the water is abundant, the trees are rich add green, and the stream has a beautiful white waterfall. Also, in the dry season, the streambed comes out with various small and large stones. 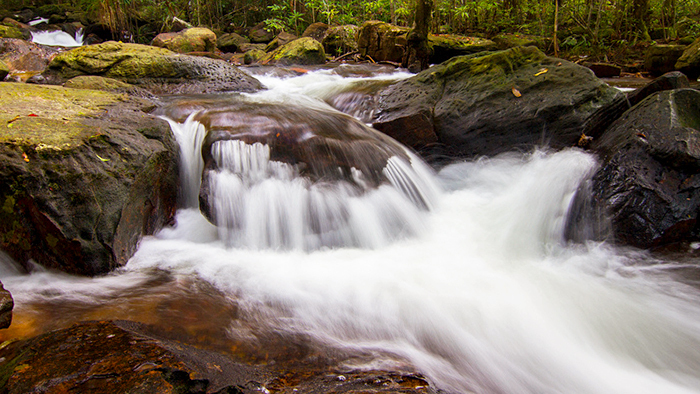 The chessboard-shaped stones appear, helping travelers have a chance to admire the magnificence of the stream. The stream is so poetic and reminds people of a water-color painting with two gods playing chess on stone slabs. In addition, tourists can climb on stone slabs, deeply reach the upper origin to listen to the stream babbling and birds singing like the music of forest – a kind of music that none of the musical instrument can completely express its melodious rhythm. Furthermore, it is totally relaxing to rest on cool stone slabs while viewing the blue sky and slowly flying white clouds as if sometimes stuck at leaf canopies affectionately and quiveringly. In a short while, time seems pausing, space backs to thousands of years ago, rough daily businesses fly out, leaving space for the peaceful inner feelings. In Da Ban stream, travelers can collect wild fruits, dip in the stream, make a fire in the cave, or catch fishes for having the most interesting meal. For a moment, we become cavemen in the 20th century. Coming to Da Ban stream, visitors will be able to see the poetic natural scenery and be in harmony with the cool fresh air. 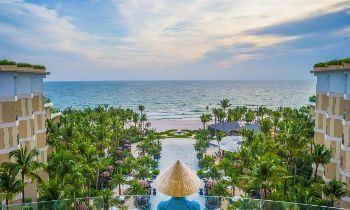 If you like the place, don’t hesitate to like and share the article with your friends to plan a trip to Phu Quoc island. Contact us or visit our website for more information. Thank you and hope you will have fun here.